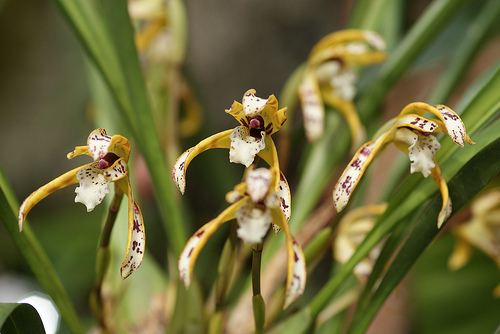 Maxillaria, the Tiger Orchid, is a very large genus of over 500 neotropical species. Most are very fragrant orchids. They produce numerous flowers, usually smallish, each borne singly on its inflorescence, in amongst the foliage. They quickly grow into very large specimens, as the rhizomes can produce multiple growths per year and are prone to wander. The genus name derives from the latin Maxilla, or jawbone, describing the shape of the lip. They come from a wide range of elevations, so temperature requirements vary widely; research your particular species, or start with intermediate temperatures and experiment from there to see what your plant likes best. Give them high lighting like a Cattleya. Maybe 3000 footcandles or so. As far as potting mixes go, they like a lot of air to the roots (they are epiphytes), but they also like to stay moist. Sphagnum moss works well because of the way it absorbs extra water and then uses it to "humidify" the roots. Many people also grow them mounted on slabs of bark, tree fern, etc, usually with a bit of moss around the roots. These plants make a lot of small aerial roots at the base of each growth, but it's mostly the roots at the base of the plant that are important. Go ahead and mist the aerial roots, but it's the ones in the pot that the plant cares about the most. They like a lot of water; don't let them dry out too much. Water just as they approach dryness. Most like high humidity, about 70%. Since the rhizomes often grow up out of the pot and wander everywhere, humidity helps the aerial roots collect moisture through their velamen.